You might remember Fran from her first guest post on my blog about how to know if it’s time to leave your past behind. I’m happy to have her back again. I also recently signed up for her free simple (but sassy) writing course and have been enjoying working my way through it. Life often doesn't go the way we planned, and when it doesn't it can be hard to find our footing again, if you're in that place I hope this devotional from Fran will encourage you. This time something felt different, and I said yes. There is no formula, strategy or method what can make sense or account for the connection between two people. The meeting in the bar, the first drink, the moment I said yes- it all felt like I had tumbled, a real world Alice, down a dark tunnel into a whole new world. I would love to tell you dating has been easy for me and I met someone kind and honest at 22. The typical church love story. I would love to tell you he was into church; he did the right things; he asked me for coffee, sent me goodnight texts with heart in the eye emojis, remembered every anniversary, let me pick the movie, initiated prayer nights, and proposed in less than 6 months. It’s been nothing like that. My dating life has looked like the games you find kids playing outside shopping centres on the wrong side of town. 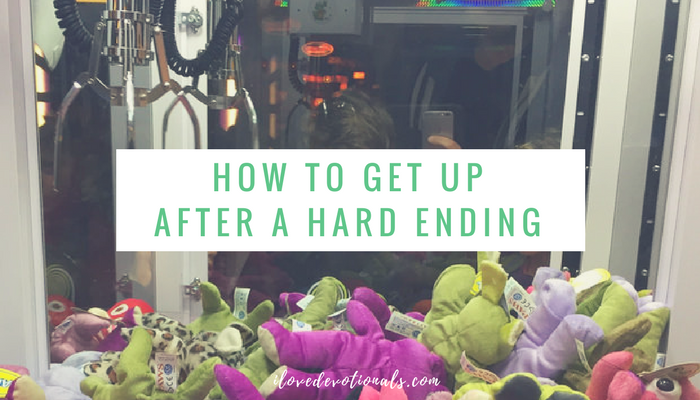 The ones where you put money in a slot, a rusty metal claw lowers into a mass of round balls with prizes, it grabs something, pulls it up and then, at the very last moment, the ball always drops. Uh-uh. No matter how many times you put money in the slot and watch the claw, the ball always drops. I recently broke up with the boy I met in the bar. Because I really liked this one, it was worse. Until you have gone through a break up I don’t think you understand what can be held in the human heart. There’s something about a break up which brings you to your knees, teaches you great lengths of empathy and, even though it will heal, leaves scars. I write this article because I am sure there are many out there who, like me, find themselves in a place of disappointment, hurt and raw confusion. Maybe it’s a breakup, or maybe it’s something else in a relationship where you feel like you are watching a game play out again and again. It’s times like this where the goodness of God holds me in so many ways. I’ve discovered, when I step back from the questions, an inner strength and peace. I’ve unearthed a maturity and perspective on the situation which doesn’t feel like me. I’ve found my folding emotions have lost their impact when I’ve shared them with friends who love me and make me laugh. My sadness has subsided when I’ve chosen to look forward, look upwards, and see this as a closed door on the long path of my life- many adventures await me. Things don’t always work out the way you think they are going to, especially when it comes to relationships. I want to encourage everyone because I know what it’s like to put another coin in the machine when you don’t want to. Either we hide away, caught in our last ruined headline or we stand up, shake it off, put on a sequin top (of course!) and get back at it again. I don’t know what boys you’ve met in bars, how many times the balls have been dropped, or what you’ve had to let go, but I believe God has got you (and me), firmly, yet delicately in his big and capable hands. In my free e-book Life, Life and More Life I share thoughts on how to make every moment count gleaned from my experiences of loving my husband through 18 sessions of chemotherapy and a bone marrow transplant. If you would like a free copy please subscribe below to receive my devotionals. Are you burnt out? Here’s one way to slow down.